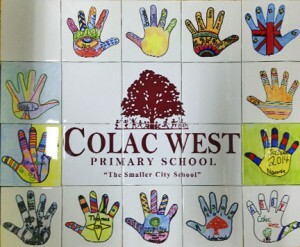 Our school art fundraiser is using each childs individual colourful art work. This artwork will be reproduced and printed onto selected products for your next fundraiser. 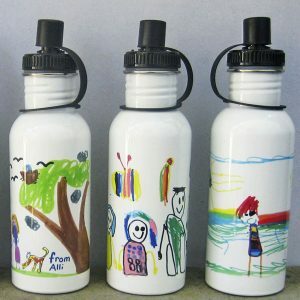 Our products are individually and permanentely printed with the children’s art. 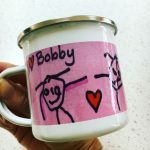 Personalised mugs, coasters or aprons make beautiful gifts for Mother’s Day, Father’s Day, Christmas or as an all year school art fundraiser. 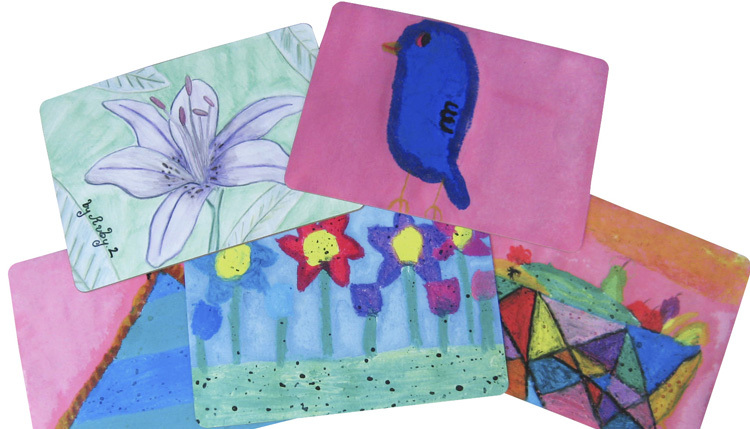 We offer the choice of selecting from a variety of product best suited for your schools art fundraiser project. We aim to offer gorgeous products which are useful as well as creating great family keepsakes and much loved gifts. We will send you the pre cut artpaper for all the children to participate free of charge. A good revenue can be achieved as our products are well priced to leave you with a suggested mark up of 30-50% on top of our reseller prices. 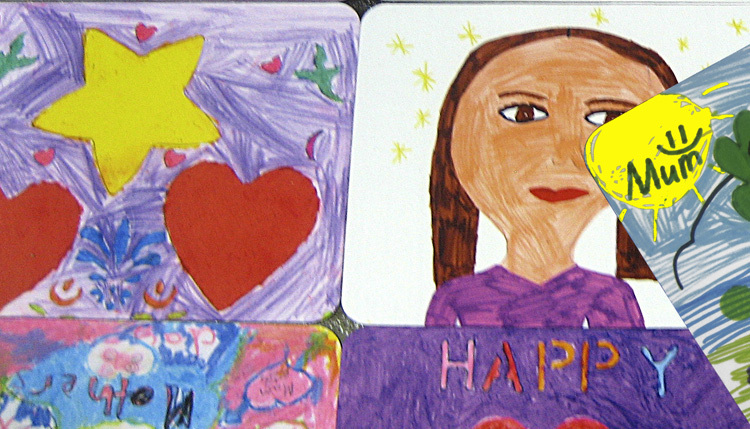 How to organise your next school art fundraiser? After you decide to organise a fundraiser for your school, you need to book it in with us. You must select a product which you decide is best suited to your fundraiser. eg. 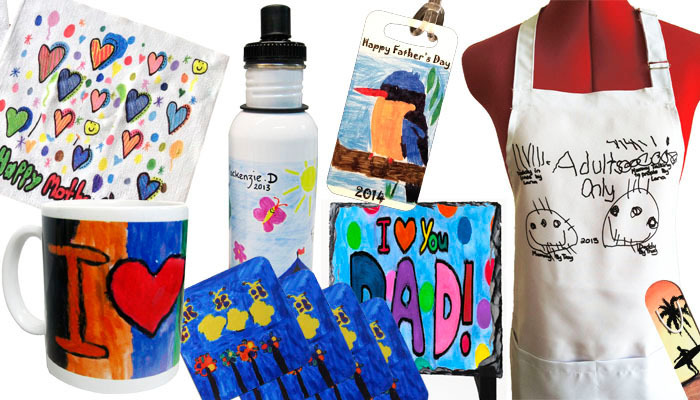 BBQ Apron for Fathersday, Placemat and Coaster for Mothersday, ..
We will supply you with all the precut art paper free of charge specific for your selected gift. Your students will create the artwork, please read our art guidelines before you start. Finished original artwork will be returned to us or a good scan of your artwork can be emailed. 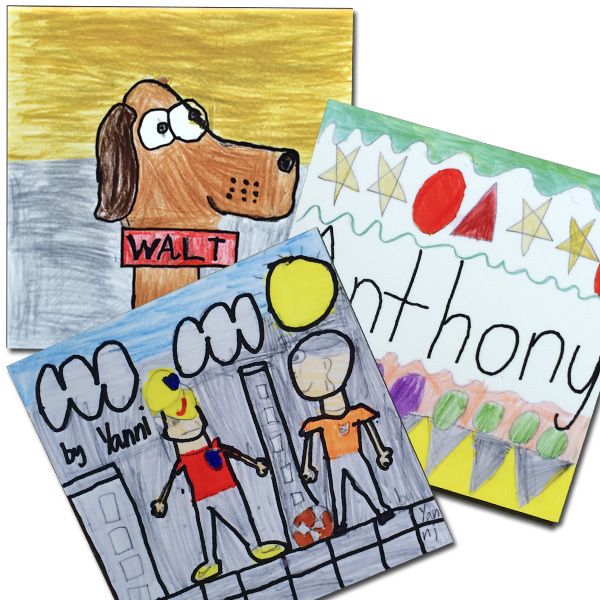 A reproduction of each child’s individual art or photo will be printed onto our gorgeous products. No peeling, lifting, rubbing or washing off, your image will be permanent. For your support, we have digital templates available which can be used as parent order forms and a spread sheets to calculate profits for your fundraiser. Minimum order is 20 items per fundraiser product. Coaster Coasters are made from hardboard with a cork backing. Your artwork will become permanent part of the surface of the coaster. Hand/Tea Towel Tea Towels are made from microfiber. This material is 7x more absorbent than normal cotton towels. 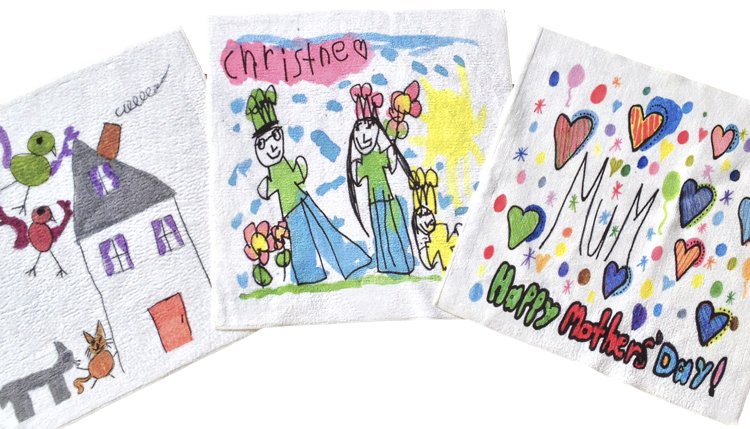 They are great to be used as sports towel, hand towel or tea towel. The size is 40x40cm and can be printed on one side up to the size of 37x37cm. 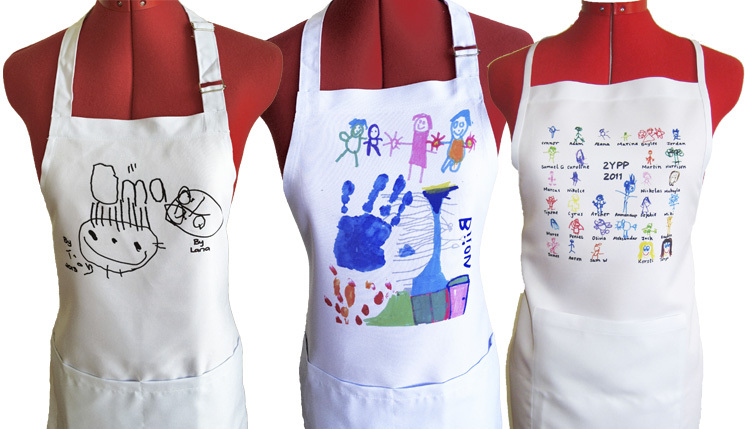 Masterchef / BBQ style aprons are 850×670 long with adjustable neck straps. Aprons are made from strong drill material and feature 2 large convenient front pockets. Aprons are available in the colour: white or stone. Mug Ceramic Mugs approx. 92mm high, fit 375ml of liquid. 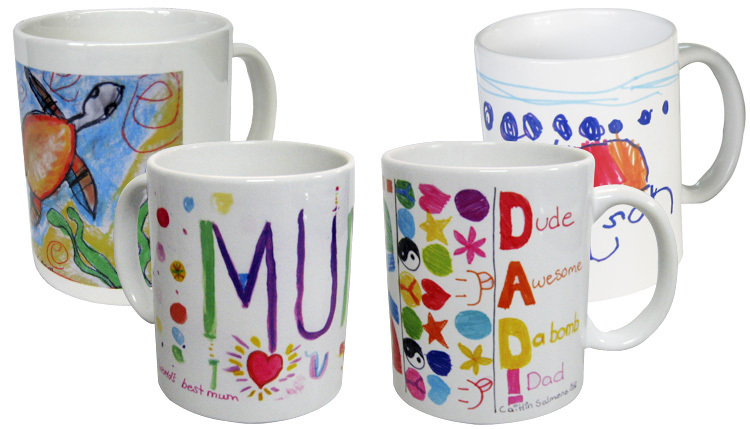 Your individual artwork will wrap around the outside of the Mug, any messages, text can be incorporated into the artwork. Drink Bottle Drink Bottle, white, 600ml Stainless Steel, approx. 21cm tall, BPA free lining! Ceramic Ornament, various shapes available, approx. size is 80mm, incl. ribbon ready to hang. 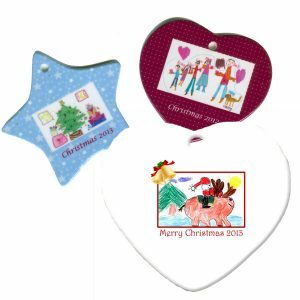 Your favourite image, artwork or text will be printed on to one side of the ornament. Key Ring Key Ring in the comfortable size of a credit card with split ring. 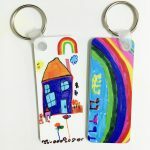 Each keyring is personalised with your child’s art. Bag Tag Bag/Luggage Tags are to withstand everyday use. 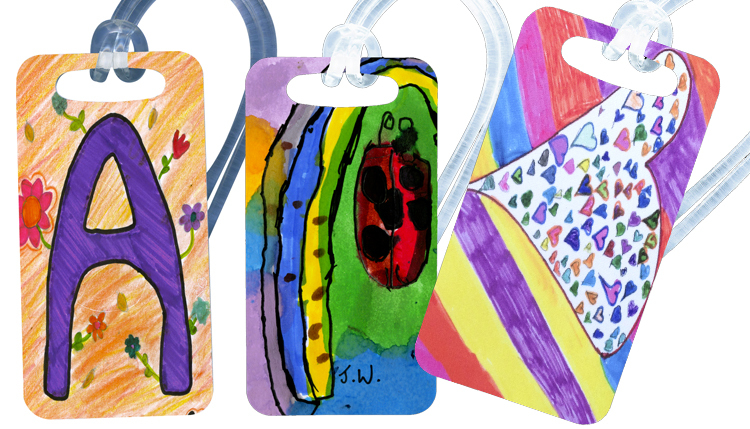 Tags can be personalised with your art, text, image or school logo! Mouse Mat Interestingly many still use a mousemat for their computer. Art Board The Art Board is lightweight and decorated with your child’s art. Enamel Mug Enamel Mugs are great to be used for children, grand parents, outdoors or around the BBQ. Wish to receive further information about our school art fundraiser? 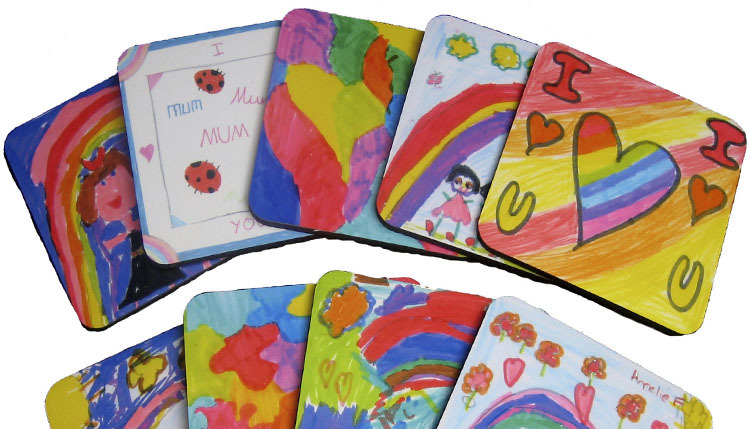 Families and children love products displaying their own kids individual artwork, especialy when they can create gifts and mementos for occasions like mother’s day, father’s day, christmas or commemorative days for your school. Ask us for our fundraiser information package, we can email it to you today. 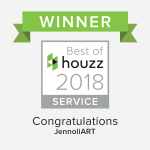 Check out our Facebook page: https://www.facebook.com/JennoliART/ or www.jennoli.com for additional information, images of current and finished projects. You have been incredible to work with. Looking forward to seeing the finished result of the tiles!